Human beings have practiced the art of divination for millenia. In some cultures, diviners studied patterns in nature - the flight of birds, the forms of clouds, or the arrangement of the stars in the night sky. In others, they created elaborate divinatory systems such as the I Ching and the Tarot. 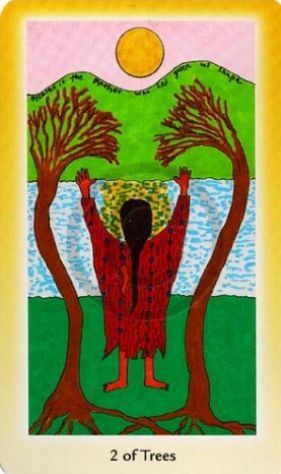 Drawing from the legacy of 50,000 years of human encounters with the Divine, renowned Tarot scholar Rachel Pollack has created the Shining Tribe Tarot, a revised and expanded version of the popular Shining Woman Tarot. 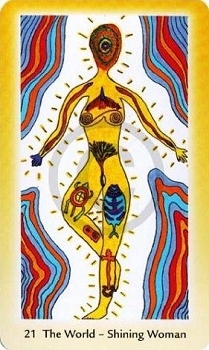 The Shining Tribe Tarot is steeped in symbolism drawn from culturally diverse systems including Neolithic rock art, Native American and African shamanism, Aboriginal art, the Kabbalah, Jungian psychology, and the traditional Tarot. The name Shining Tribe has a special meaning, says Ms. Pollack: "All of us who work with Tarot form a kind of tribe, one whose roots go back many thousands of years before the actual appearance of Tarot cards. This is the tribe of diviners, those special magicians, shamans, psychics, and visionaries who use cards, or sticks, or trees, or stones, or shells to communicate with the Gods." The accompanying book includes detailed descriptions of the origin and history of the symbols depicted on each card of this unique deck, as well as explanations of their meanings in divinatory spreads. In addition, you will also learn how to read the cards for a variety of purposes, including divination, advice, and guidance along your own personal sacred journey. Learn how to gain insights into the nightly messages from your subconscious mind with dream readings, and how to activate a card to bring its qualities into your everyday life. 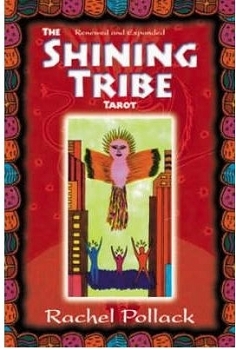 The Shining Tribe Tarot is a pleasingly vibrant deck. The deck is fully illustrated with simple designs. The Minor Arcana has been renamed Trees for Wands, Rivers for Cups, Birds for Swords, and Stones for Pentacles. The court cards have been renamed Place for Pages, Knower for Knights, Gift for Queens, and Speaker for Kings. I find this deck enjoyable to use and easy to interpret. This may not be the best deck for beginners, however intermediate to advanced readers will have no problem using this deck. I recommend this deck for people who love colorful decks and collectors.